When it comes to answering the debate over old-fashioned wooden sleds with metal runners versus more modern plastic sleds, there are really only two things to consider – snow conditions and weight. Yeah, I know, speed is a big factor too, but I think the speed of any sled depends greatly on the sledding hill and the condition of the snow on it. I thought I would share my views on the different types of sleds and which ones I think offer the most fun for playing in the snow. The primary issue with different types of sleds and weight is how difficult it is for the rider(s) to drag it back up the sledding hill. Weight also plays a factor when the snow is soft and not yet packed down. A heavier sled often just sinks into powdery, unpacked snow. 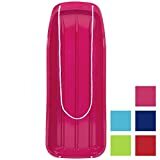 Lightweight sleds, with larger areas that contact the snow, are great for conditioning the hill as well as being easier for smaller children to carry. 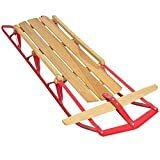 Those long plastic toboggan sleds were one of my favorite types of sleds when I was a kid. They were extremely light-weight and could generally be dragged or carried up the sledding hill by most children. Once the snow on the hill had been packed down and made smooth, those plastic sleds really flew down the hill. Pile on several riders and the sledding run usually ended in giggles and everyone landing in a heap. They rarely lasted a season of snow play before cracking, but, oh they were fun while they lasted. Those light-weight and rather flimsy plastic toboggan sleds I used have been replaced with much more modern versions types of sleds. They look more durable but I suspect that may mean they also weigh more. From everything I’ve read, the overall performance is similar. Steering these types of sleds is usually weight-based – lean to the right, turn to the left and vice versa. Some of the more modern versions offer actual steering. Plastic flat-bottomed sleds work in all conditions but, in this sledder’s opinion, they work best on soft, wet snow. You can run them in more icy conditions but I always thought the icier the sledding hill, the harder it was to steer and control the plastic sleds and toboggans. With softer snow, plastic or flat-bottomed types of sleds can end up being the only good option. A few plastic sled rides down the hill also helps to make the sledding hill smoother and faster. We often used these sleds to condition the hills prior to bringing out the runner-based sleds. Round disk sleds, whether plastic or metal, provide for a hair-raising ride down the sledding hill. They generally require more firmly packed snow than the plastic flat-bottomed sleds do but they can really zoom down the hill. These types of sleds are also steered by tossing your weight to one side or the other. But, I always found it almost impossible to control these sleds; more likely than not, we went down the hill backwards. The spinning, out of control slide down the hill was fun but they can be dangerous to both riders and other sledders. From my own experience, I would suggest never allowing small children to ride a flying saucer sled when playing in the snow. For some reason, their reaction to sliding towards a tree is to remain on the sled until it crashes while older children are generally quick-witted enough to ditch before contact. There’s a group of plastic sleds that I would call hybrids. These types of sleds combine the aspects of a flat-bottomed sled with the speed of the flying saucer sleds. Steering is still generally weight-based but some, like the Zipfy sled, are controllable and fast enough for competitive slalom courses. These hybrid types of sleds will run on softer snow but do best on hard-packed snow. Inflated-tube sleds aren’t plastic or runner-based. But, they are everything plastic sleds can be with a rubbery bounce thrown in. Steering? Forget-about-it. Fast? For sure. Fun? Big time! Breakable? Highly. Inner tube sleds are perhaps the most fragile of the group but bring back memories of some of the most fun I ever had playing in the snow. They are generally made out of rubber or PVC. They can fly down a sledding hill but debris in the snow or a stray rock can tear them. Inflated tube sleds should be reserved for use only on deep snow. They work great with all types of snow conditions but we usually stopped using them if the hill became heavily tracked and icy. We found out the hard way that ice can slice open some tube sleds. There are tons of options for inflated tube sleds. Some even have seats and handles. A few manufacturers have even found ways to make the valve stems less pokey. From the reviews we checked, a lot of the more decorative tube-based types of sleds seem to be more fragile than the old fashioned black inner tubes. It seems like the inflated-tube sleds that come with covers might offer the best of both worlds – great sledding and increased sled durability. It used to be that the only sleds with runners were made out of wood and had 2 metal runners. The good ones lasted forever. Add a bit of wax to condition the runners and these babies could really fly. Their major downfall is that they basically just sink into soft snow and are virtually unusable until the sledding hill has been compacted and conditioned by other sledders. They are also generally heavier and harder for little ones to drag back up the hill. 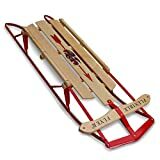 When I was a kid, the old-fashioned style wooden sleds were more steerable than most of the plastic sleds. The sledder could push the front part of the sled from side to side and that would move the runners a small bit to the left or right. Leaning to the opposite side you wanted to go further helped with the steering. Once the sledding hill and the landing area were conditioned, the wooden sleds with runners often went faster and further than all of the other sleds on the hill. Sled designers are now creating plastic and composite metal runner-based sleds like the Flexible Flyer PT Blaster and the Hammerhead line that combine the speed and control of the wooden sleds with the smooth ride of the plastic, flat-bottomed ones. They have the benefit of being made of lighter materials with the steering and control of runner-based sleds. 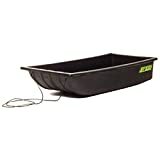 These types of sleds have 3 or 4 runners instead of 2. The extra runners are what makes them so steerable. Some even have steering wheels to control the front runner. From everything we’ve read, they are the fastest and coolest types of sleds available. We have, however, seen some warnings that these speed demons may not be suitable for younger children as they reach speeds some children are not prepared to handle. 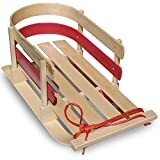 It seems to us that the answer to the question of modern plastic sleds or old-fashioned wooden sleds is a resounding BOTH. The modern runner-based sleds are light-weight, work on more types of snow and are super fast. When combining the glide-ability of the plastic, flat-bottomed styles and the speed and control of runner-based sleds; manufacturers have finally cracked the secret sauce on what makes the best sled. So, where do you come down on the wood vs plastic sled argument? Have you used one of the newer types of sleds that combine the best of both? Or does the thought of a cold winter’s day mean avoiding the cold and curling up in front of a roaring fire?